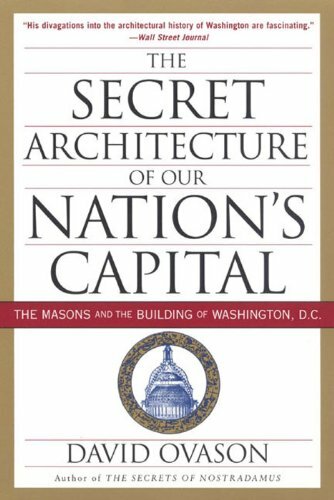 Esoteric Architecture of Washington, D.C.
Long before Dan Brown’s enigmatic bestseller The Lost Symbol popularized the idea that Masonic emblems reveal a conspiracy involving the history and design of Washington, D.C., generations of writers have speculated on the subject. 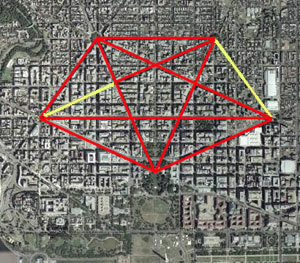 Various Christian authors have developed an extensive mythology around the idea that a satanic pentagram marks the original D.C. city plan. Meanwhile some Masonic authors celebrate possible influence and ubiquitous symbols without regard for objectivity. 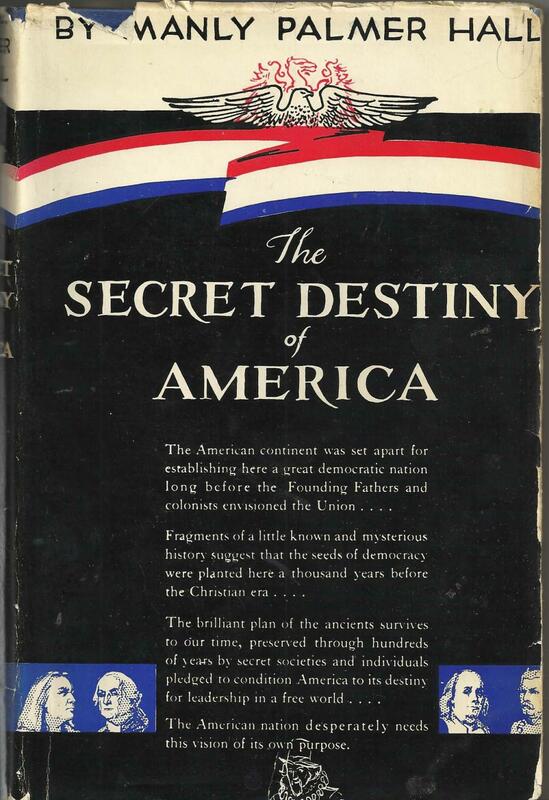 In his influential, but also much maligned, The Secret Destiny of America, when Manly Hall wrote that America could become a new more enlightened Atlantis, he mentioned the “democracy” of ten kings and praised the idea of one world government in a world of free trade. Taken out of context, in today’s zeitgeist, he seems to be advocating an elitist neocon agenda. But in fact, writing in 1944 with the world at war, he was trying to inspire Americans to a vision of a better way of life, a world of cooperation. Hall was always free with metaphors. 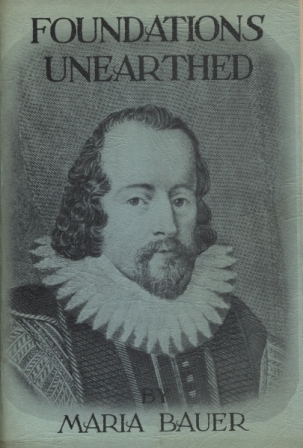 Without connection to universities, in the days before the Internet, he depended on a limited pool of often-questionable scholarship. His book should be taken as a stirring blend of fact and myth – visionary history, not accurate scholarship. 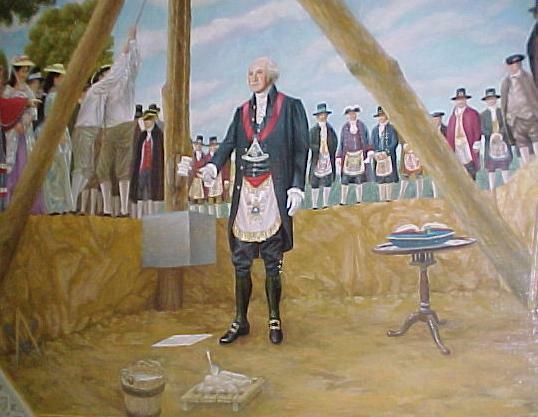 In 1989, a book titled The Temple and the Lodge claimed that George Washington interfered with design, but no proof except speculation was offered to support the thesis. The authors also failed to explain the correspondence between Washington, L’Enfant and Jefferson, indicating that Jefferson was the one consulting L’Enfant about the details of D.C., not Washington. Jefferson was not a Freemason. David Ovason, the dean of this school that brings new meaning to the word speculative in Speculative Masonry, is honest throughout his work about the fact that most of the conclusions to be drawn, from the apparently obvious to the obscure, cannot be verified. For example, consider the many zodiacs in D.C. studied by Ovason. They could have all been designed in advance by a secret society, then created over generations they unfold not just a message but also a series of magical acts. But then Freemasons being the studious types they are we can safely assume most Freemason architects working in D.C. would study the work of the Masons who built zodiacs in the city before them, continuing and commenting on their themes. Of course, some of the zodiacs may have been built by people who had nothing to do with Freemasonry. Nevertheless they may have decided to study zodiacs of D.C. to which they would be adding their own designs. Perhaps a Mason or two decided to ignore tradition and create something fresh? Ovason has shown great patience in exploring these confusing nuances and possibilities. Unfortunately, most of the popular authorities on the subject have no surveying experience, and much of their work is riddled with elementary errors spelled out in brutal detail by DCsymbols.com. For example, Ovason, who paints a truly lovely picture of sunset in D.C. in August lining up with Pennsylvania Avenue, comes out on the wrong side of a protractor. Perhaps the most extreme example of the trend is Marie Bauer Hall, whose booklet Foundations Unearthed documented the beginning of her lifelong preoccupation with Bruton Vault in nearby Virginia. I knew Marie and worked with her when her husband Manly asked me to help make her ideas more accessible to people. Many times I heard her tell the story of the worldwide reformation that should have been sparked by her discovery, but the vested vestry interests and the power elite obstructed her until the contents of the vault were removed and hidden from the people. Had the people been given the chance, they would have been transformed, she insisted, to begin a true new age of enlightenment and equality. Marie described this with such passion she would sometimes become enraged or shed tears at the urgent need to get the contents of that vault to the people as their birthright. “What’s in the vault?” I asked Marie. The original Shakespeare manuscripts, and the original of the Constitution of the United States, and documents that would reveal that Sir Francis Bacon, working with the Rosicrucians, and the Freemasons, designed America to free humanity from tyranny. A theory her husband also held, except for the vault part. At the time, swept away by patriotic enthusiasm, my girlfriend’s common sense irked me: “not many people care about things like that,” she pointed out. She admitted such revelations might shock academia, and various other intellectual subcultures, but the Superbowl would still get way more ratings, and get talked about longer. Marie was quite convinced that the American people, and the world would be awestruck and inspired by the genius and self-sacrifice of Bacon and his enlightened co-conspirators. I tried to keep an open mind because the goal seemed so noble to me. We could renew America, Marie believed, if we understood these symbols, and uncovered the truth about the intentions of our founders. Here we are, arguably, at the heart of American exceptionalism, the belief that America unlike any other nation was born to a great destiny ordained by the only true god. Yet any student of history knows that ancient Egypt, ancient Athens, ancient Rome, and the capitals of every empire since men first noticed the stars, included design elements oriented to heavenly bodies, and edifying symbols intended to prove that the destiny of that culture differed from all others by divine sanction. We might almost say that the surprise would be if D.C. lacked these symbolic embellishments. But what of the first surveyors and designers of D.C., did they have the conscious intention of dedicating the city, or were they even more ambitious? Can a city be an invocation, a communication with the gods, a prayer in brick and mortar? 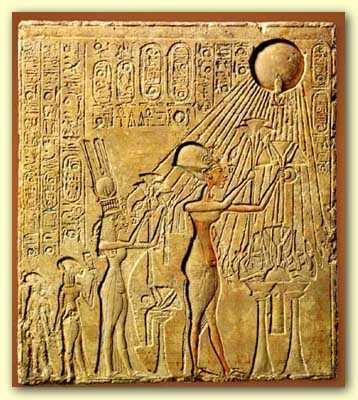 The ancient Egyptians were supposed to have mastered the art of drawing the energy of a divinity into its image. Even today it’s easy to find people telling stories about Egyptian statues that seem to move. The Sekhmet lioness statue in the garden outside the Cairo Museum is famous for the ginger cats that nap there. Beyond the calendar of Stonehenge or the astronomical orientation of the Great Pyramid, could it be possible to build a city to receive the wisdom, the protection, and the guidance of the divine? Reading the stars, and by the law of correspondences, using materials associated with certain planets and the right hour of the right day of the week, to invoke the desired, has long been a human preoccupation. Could a capital city be made into a gigantic talisman? The first designers of D.C. had esoteric interests, but were they initiates serving secret societies? George Washington, well-known for his Freemasonic activity, hired the talent, picked key sites and building designs, but didn’t live to see the completion of the city that would be named after him. In his letters, he expressed more interest in comfortable rooms than symbols. One of the surveyors Washington hired was African American astronomer Benjamin Banneker, whose father had been a slave. Banneker studied advanced mathematics and astronomy using borrowed books and instruments. Many nights he would wrap himself in a warm cloak to recline under a pear tree observing the stars until dawn. Just shy of sixty years old, following George Washington’s orders, Banneker worked with surveyor Andrew Ellicott, taking the first measurements for the design of the federal city. In his journal Banneker records the full solar eclipse he witnessed in the field. He published six annual Farmers’ Almanacs between 1792 and 1797 compiling cures and treatments, lists of tides, astronomical data, including eclipses, all calculations his own. In Banneker’s almanac appears an illustration of the sign Virgo as a woman holding a five-petal flower. 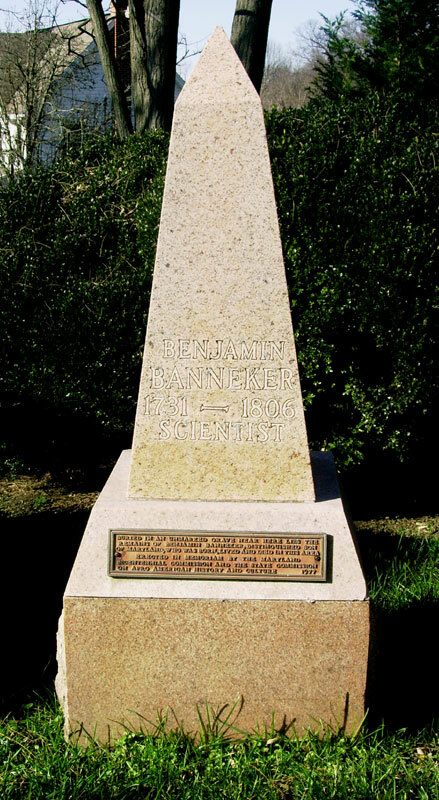 We have no evidence to connect Banneker with Freemasonry, though his obelisk funeral monument is suggestive. As an astrologer it’s interesting to note that Mars was conjunct this position and quincunx Uranus when the notorious Beltway sniper attacks occurred. But this date is in question as research by Ken McGhee suggests April 15, may be the real birthdate of the city after all. As McGhee writes: “The Alexandria Gazette, published on April 21, states the event occurred on April 15; it describes the ceremony and gives the names of those who attended. I think this is where the error on the date came in. The Gazette was published weekly; the issue it appeared in was the April 21 issue, but the date of the event was April 15.” Jupiter was nevertheless at 23 degrees Virgo. I’ve heard this same event was also reported in two other newspapers–one is the Massachusetts Spy and the other was in Philadelphia. But how can we be sure Virgo isn’t Columbia? 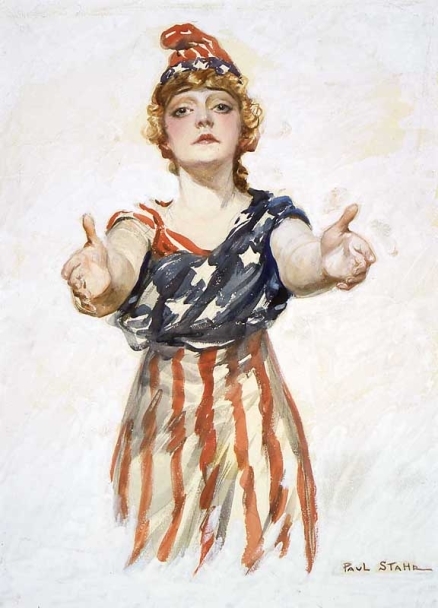 Before Uncle Sam, Americans symbolized our country as Columbia. Samuel Johnson seems to have coined the word but Columbia first became a significant symbol in America in 1776 in a poem written by Phillis Wheatley, the second African American Poet and first African American woman published in America, a slave. In the 19th century, Columbia became a common symbol of the United States. Before the “Star Spangled Banner” became our official anthem in 1931, “Hail Columbia” was the unofficial; these days they only play it for the vice-president. While Columbia has been shown bearing a sword, she was often depicted with a stalk of wheat or a five petal flower in hand, but were some sculptors actually honoring Ceres, who along with other Graeco-Roman deities adorns allegorical sculptures all over D.C. dedicating America to science (Minerva) and commerce (Mercury), to agriculture at home (Ceres), and dominion over the seas (Neptune)? They preferred the Roman names of these deities, not the ancient Greek, though Athens practiced an early form of democracy, and Rome became an empire. Various symbols have been found in the design of D.C.: pentagram, pyramid, cross, cross-section of the inside of the Great Pyramid, Masonic compass and square. But none of the symbols are rendered with complete accuracy. No proof of any such plan has ever been found. Contrast the incomplete symbols of D.C. with the impeccably Masonic design of Sandusky, Ohio. Major L’Enfant the city planner, hired and fired by Washington, was initiated as an Entered Apprentice, but he never bothered with achieving any of the higher degrees, nor do we have evidence that he attended Masonic meetings. 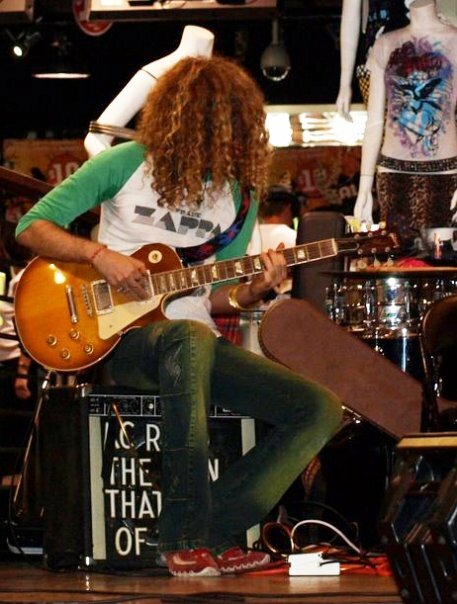 In short, he never became a full member. As befits a man whose father was a court painter for the Bourbon kings of France, L’Enfant’s plan was based on André LeNotre’s Versailles but also Christopher Wren’s unrealized plans for London. After Washington fired the perfectionist and cantankerous L’Enfant, Andrew Ellicott, the head surveyor took over, expanding on L’Enfant’s ideas with an imagination more given to the monumental. Ellicott not only surveyed and helped design D.C. (and Eerie, Pennsylvania) but also mapped for the first time areas west of the Appalachia; he also taught surveying to Lewis of Lewis and Clark fame. Even so illustrious an intellectual as Francis Fukuyama falls into the swamp when writing about Ellicott for The American Interest in 2007, declaring that Ellicott was a Freemason, when we have no evidence that he was. 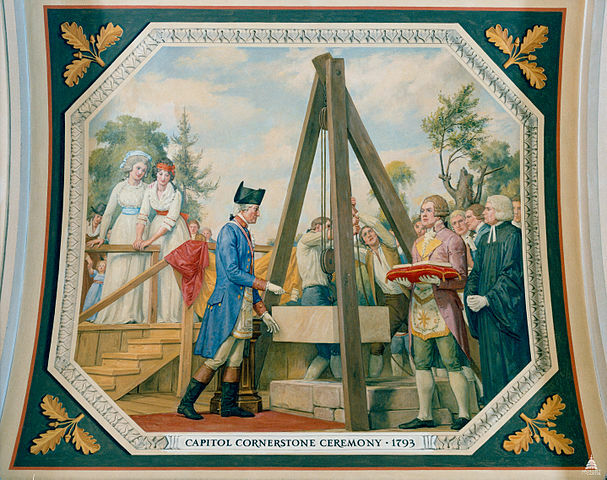 Still, a Masonic obelisk was a key part of the original design for D.C. And how can any scholar underestimate the influence of Royal Arch Masonry, which first reached America in the lodge George Washington attended? 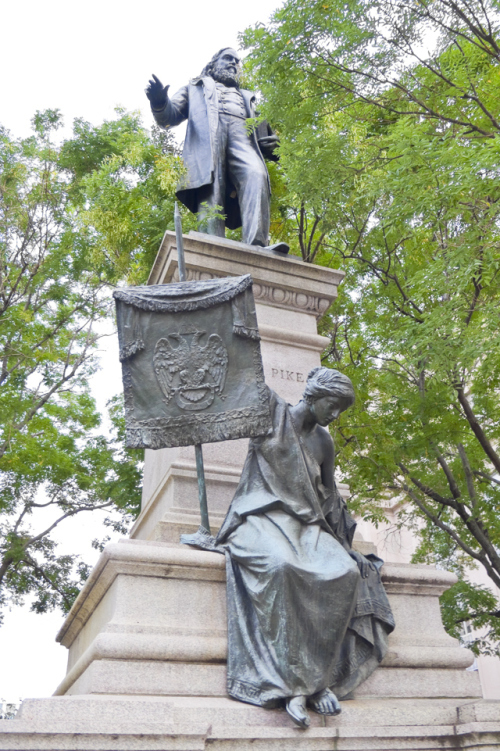 And what of the influence of Albert Pike, the only Confederate officer to have a statue in Washington D.C.? Pike, through his Morals and Dogma, wielded enormous power over the Scottish Rite as it and D.C. developed in the nineteenth century. To complete the collection of mysteries, consider that significant portions of Morals and Dogma were more than directly inspired by the writing of the Parisian magus Eliphas Levi, an expert on Cabala, symbolism, and transcendental magic, who wrote about the Egyptian practice of making a figure sacred by invoking the presence of the deity it represents. Yet it would not require membership in Freemasonry for a builder or sculptor to adopt Masonic symbols. In 1760, Hiram; or, The Grand Master-Key to the Door of Both Ancient and Modern Free-Masonry was published in London, revealing details of Masonic ceremonies, symbols, and even secret names and handshakes. In America, Masonry attracted poor craftsmen, country cousins, and wealthy landowners alike. As the poor and the powerful traveled west, Masonry with its alleged connections to Moses and ancient Egypt provided a sense of comfort. Biblical quotes freely mixed with Masonic ideas in hymns and Freemasons had the reputation of being upright, moral types, the builders of not only buildings and towns, but of a new world of high moral standards for all. Until 1826, when William Morgan threatened to publish a book revealing Masonic secrets. False arrest escalated to arson at the printer’s shop, then the determined Mr. Morgan disappeared without a trace, inspiring a wave of angry paranoia not seen since the Rosicrucian scare of eighteenth-century Paris. Local Masons were accused of murdering Morgan. Soon an anti-Masonic party gained popularity in U.S. politics. Americans were disgusted with corruption in the halls of power and they blamed Freemasonry. Morgan’s beautiful widow Lucinda later became one of the wives of Joseph Smith, whose Church of the Latter Day Saints reflects strong Masonic influence. Among the elder occultists I had the pleasure of meeting thanks to Manly Hall, and among the spiritualists I met on my explorations of forbidden territory, I often heard the phrase “capping the pyramid” as a short hand description of some mysterious fate for the United States, America’s esoteric destiny. The dollar bill has the most familiar symbol of the uncapped pyramid, although it is capped by the all seeing eye. 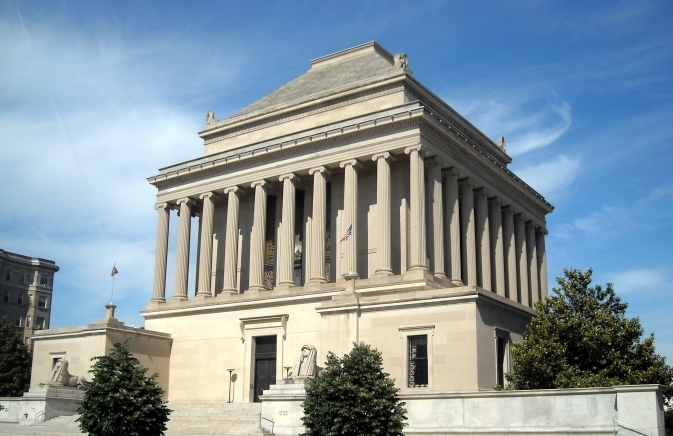 The Scottish Rite House of the Temple in D.C., with its thirteen-step unfinished pyramid on top, is the most monumental. I was told that many ancient Egyptians were reincarnating as Americans to achieve the culmination of a plan that began in the days of the pharaohs. In his writing on America’s secret destiny, Manly Hall presented an idealized interpretation of the Pharaoh Akhenaton as “the first democrat.” While most scholars would disagree with Hall’s rosy portrait of the pharaoh, there’s no denying his observation that here was the first great ruler in history to insist on being depicted with his arms around his wife and children. But what possible connection could Akhenaton have with America? Like an overtone of music or an unexpected word in a poem, some tantalizing almost-fact always seems to pop-up when the researcher is ready to refuse the idea once and for all as obviously ridiculous. For example, Akhenaton’s temple to his queen Nefertiti was oriented to the setting of the star Spica. Washington D.C. is oriented to Spica. This tantalizing fragment of a fingerprint that might be nothing but a coincidence is the stuff of which conspiracy theories are made. 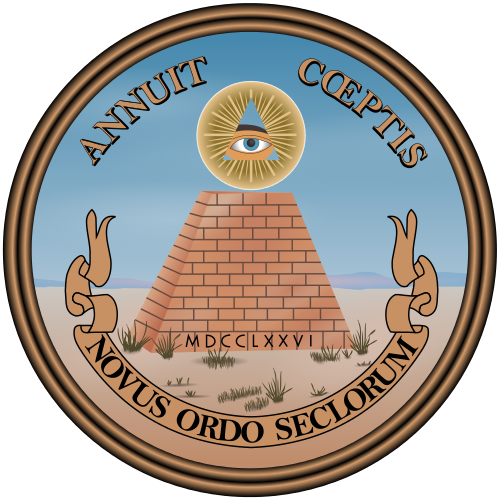 Veteran provocateur Robert Hieronimus, in his popular book on the Great Seal of the United States, suggested that capping the pyramid means crowning the multitudinous forms of matter with the all-seeing eye of the divine eternal monad thereby uniting the opposites to create an enlightened citizenry and society. He ascribed such talismanic power to The Great Seal of the United States that he wrote if given appropriate attention, like an ultimate alchemical emblem of the Great Secret, it would inspire an evolved citizenry and society. For Hieronimus, when the Freemason FDR lifted the Great Seal from the obscurity of government use to the ubiquitous dollar bill, America was given the opportunity to evolve into a spiritual nation. The history of corruption in D.C., our bellicose foreign policy and tendency toward predatory capitalism, not to mention the notorious predicament of the poor in D.C., would seem to contradict the notion that the city embodies a greater wisdom. But then the United States has only two and a half centuries of history. With the U.S. Pluto return due in the early 2020′s, perhaps the American story has hardly begun. Yet, even for the most materialistic explorer, D.C. is nevertheless a talisman. Masonic and pagan symbolism including the numerous zodiacs provide undeniable proof of the influence of what modern academics refer to as the American Metaphysical Religion, that amalgam of native beliefs, immigrant superstitions, Platonism, transcendentalism, Freemasonry, astrology, Rosicrucianism, alchemy, and religious and spiritualist beliefs from around the world that modern scholarship proves has had great impact on American history [see also the interviews with Mitch Horowitz about his book Occult America]. While it cannot be proven that a secret society shaped D.C., we can certainly be inspired by so many individual efforts to remind us of what America was meant to be, and perhaps still can be. Washington D.C. is the ultimate monument to American Metaphysical Religion. Ironically, while our culture, media, and until recently academia have ignored the importance of the esoteric spiritual history of the United States, from the alchemist who was the first governor of Connecticut to the astrologer who advised President Reagan, D.C. itself pays homage to the importance of America’s diverse spiritual roots. This blog was commissioned by Greg Kaminsky for Occult of Personality.